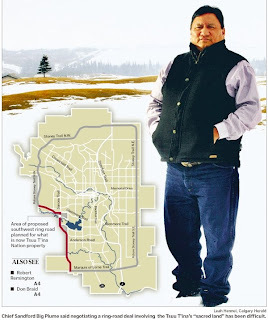 Calgary Rants: Did the Tsuu Tina Nation make a massive mistake in rejecting the SW Ring Road Deal? Did the Tsuu Tina Nation make a massive mistake in rejecting the SW Ring Road Deal? Did the Tsuu Tina Nation make a massive mistake in rejecting the SW Ring Road Deal? That looks like the $500MM question! After having previously posted on the Tsuu Tina's rejection of the SW Ring road land sale with the province and their rationale behind it, it looks to me me that the Tsuu Tina now realize that they will have to face some serious unmitigated consequences with their decision. The province has declared the deal DEAD and they appear to refuse to go back to the bargaining table. I believe that this failed deal may be a source of embarrassment for Premier Stelmach, given his hard work on negotiating this deal and his public commitment to getting this project completed. Now that this option appears off the table, I was pleased that City Council is pushing to move ahead with a " PLAN B" option, which includes an interchange at Glenmore Trail and 37 Street SW. As per my previous post on this, an interchange at this location is bad news for the Grey Eagle Casino! The City of Calgary does not legally have to make the 37 Street Casino entrance open to the public. They confirmed that they will continue to make the Anderson Road entrance legally open as this is required. If the city closes off 37th Street, this will kill the Grey Eagle Casino's business as there will be no quick entrance to the facility. I guess then the Band will have to create a "Casino" road from Anderson Drive through their Sacred Land Trust after all. Quite the irony. If the Tsuu Tina want to go back to the table, I hope it is for less money and a worse deal. They played their cards all wrong on this hand, as they figured the province will spend ANY amount of money to get this deal done. Big mistake. I am now off to New York City for vacation. I wonder what I will miss? Good example of greed will get you. Absolutely. Consider that the value of the consideration for the Tsuu Tina land - the appraisal - was done in 2007/2008. Very different times are upon us now. For the Province to now come back, with even better terms for the Band, when finances are stretched? Echoing the previous comment, I'd say it will be a nice cautionary example. Hey Shane...interested in your feedback on my blog on the SW ring road. Wasn't there some concerns over the weaselhead area too? In that case plan B may truly be the best of all worlds, leave a park to the critters, leave lakeview alone (beautiful neighborhood), and do a bit of collateral damage to the casino business as a screw you for 40 yrs of negotiations? Is that a win/win?